In my previous article I warned about potential problems if an appliance is pushed in behind flooring and underneath a worktop. It happens surprisingly often. Read the full article here – fitting floor tiles in front of appliances. If you already have an appliance that is stuck, and you cannot get it out over the flooring in front of it, then this is the article for you. Both of these articles were inspired after I had to cut away a 3 inch strip of cushion floor, and drill and chisel out two small channels from the tiles beneath in order to pull out my daughter’s dishwasher for a repair (See “drastic action” paragraph below). If the appliance is freestanding then pull it forward until the front feet hit the tiles. Most appliances now have adjustable feet, so the idea is to screw them in as much as possible to reduce the height of the appliance. You will need to lift up the front of the appliance as much as possible to take the weight off the feet. Then screw in the front feet as much as possible. There may be a locking nut that you need to undo and wind down first. Hopefully you can now create a bit more headroom to lift the appliance over the tiles. This will let you pull the appliance forward until the back feet hit the tiles. If you are lucky you might be able to get the appliance out now. But sometimes you might not be able to get the back feet over the tiles either and you can’t lift the appliance up at the back because of the worktop. With a freestanding appliance it’s impossible to reach the back feet. If you pull on the front of the appliance to try and lift the back feet up and slide it forward you might be able to get it out. Placing a towel or something under the front feet might assist in sliding. If you cannot lift the back feet over the flooring you can try to remove the front feet to gain a little more tilt. This will give a few extra vital millimetres. Place a towel underneath the front of the appliance to prevent it scratching the flooring and to ease sliding. Then try to pull forward and tilt the front of the appliance to lift the back up. If despite trying all this the appliance will not come out you have two options. You could try to remove the worktop. But in most cases this is not an option as they are often well integrated and sealed in place. It might be an option though. If not you will have to resort to more drastic measures, which is what I had to do to get my daughter’s dishwasher out and is described in the last paragraph. Built-in appliances might have an adjustable device attached to the top, which is wound upwards to jam against the underside of the worktop. You will need to loosen or remove any such device before trying to pull out a built in appliance. It might then be possible to remove the appliance easily. But you may still need to screw the front feet in to lower the height of the appliance. This may allow you the room to lift it over the tiles. Then you can pull it forward. However, the back feet may now hit and get stuck under the tiles. If so you need to screw the back feet in as well. If the appliance is built in it is usually possible to adjust the back feet from the front using a screwdriver. The photo shows a side view of a built in appliance (with the front on the right). There is a rod that goes all the way back and adjusts the back feet up or down. The screws to adjust the rear feet should be easily accessible from behind the kick strip at the front of the appliance. I recently had to repair my daughter’s dishwasher. 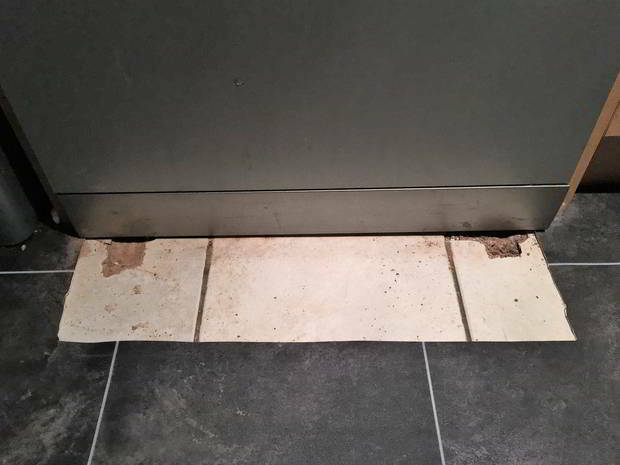 Floor tiles had been fitted right up to it – but not behind. Lino had also been fitted on top of the old tiles. It was underneath a worktop that had been fitted too low so the dishwasher would lift up only about 5 millimetres. That just wasn’t high enough to get it over the tiles in front of it. Taking off the worktop was not an option because it had a sink fitted to it. The front feet were wound in as far as possible but the dishwasher was completely stuck in there. The only way I could get the dishwasher out was to cut off a strip of the floor covering. I then had to mark out squares in front of the two front feet. I spent 20 minutes then drilling small holes and chiselling two channels to allow the feet to come forward. Eventually, after destroying the tiles and flooring the feet would come out far enough to allow the dishwasher to lift over the tiles. As you can see from the photo this is not something you want to happen. The strip of floor covering was placed back in place which covers up the 2 channels but obviously you can see that there is a patch of flooring in front of the dishwasher. There was really no other option. what is the best way to pull a washing machine out? The other problem with not tiling under appliances is that the edge of the floor covering can have a nice sharp lip. 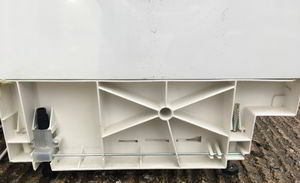 Some freezers have very little ground clearance and, as you push them over thie lip on the edge of the floor, the vapour barrier on the warm side (the room side) of the insulation gets torn. Since some types of insulation can absorb water, water vapour from the air in the room is now able to penetrate and condense behind and in the insulation, rendering the insulation less effective as it becomes sopping wet. Then the water starts to drip onto the floor under the freezer. I did manage to cut out most of the wet insulation and dry the freezer out over a summer in a greenhouse, re-insulate to some degree, and fit a new vapour barrier, but the insulation was never as effective as before and I eventually, and reluctantly, disposed of that freezer.